I was reading your web page when I came across a really neat marine shrimp, Lysmata cyanea. I figured that you might know someone that works with this particular species of shrimp or where they originate. Would you be able to help me in acquiring some specimens? Any help with this would be greatly appreciated. Many species highlighted in academic research are not part of commercial trade. These species are often rare or endangered or, in the case of new discoveries, not classified or surveyed yet. In other words, there's no commercial access to such species that are so well outside commercial aquarium trade. That isn't to say there's no way at all to obtain specimens, however. There is a thriving underground black market for rare and valuable crustaceans driven mostly by private collectors but also fueled in part by academia and museums: unscrupulous collectors and curators and university students, faculty, and staff. In Africa, for instance, importing O. rusticus is quite lucrative as the return on successful aquaculture in Africa is estimated to be worth hundreds of millions of euros annually, small change in comparison to other markets, but huge in the scope of source of the specimens. The sad part about students mixing up with the seedy underbelly of animal trade is that both people and crustaceans die needlessly. Recently, pirates murdered the crew of a ship carrying several tons of O. rusticus; eight are known dead and two are missing. Last June, the crew of a trawler secretly hauling Diamond crabs were killed after engaging in a gunfight with the West African Coast Guard. Ultimately, such disregard for animal life goes against the tenets of research and objectifying specimens leads to a loss of knowledge and endangerment of those involved, whether they are foolish undergraduates or sunburned pirates. Do not support this illicit trade and instead report it to your local authorities. If an animal is unfamiliar enough to remain outside the aquarium trade, leave it that way. Why Did My Fiddler Crab Die? We volunteered to take the Fiddler Crab from my son’s in-class science project. The crab appeared to be doing well, eating and taking some dips in his “pool” of salt water. We changed his water and his food regularly. He burrowed through the substrate mixture (sand and humus?) in the bottom of his cage – and often slept under his see-through pool (the container the class used to provide salt water). He was more lively than usual over the weekend – climbing up and over the flat seashell, ½ coconut shell, fake plant, and swimming pool. Today, he appears liveless – he is upside down in his cage and has not moved since we woke up this am. There doesn’t appear to be any new appendages or a new crab anywhere in the cage. Can you tell me how to tell if he is dead, molting, or already molted? This mom is unfamiliar with fiddler crabs and wants to make sure we know what “Thunder” is doing, before assuming him dead. Thunder, from your description, appeaears to be dead. I am so sorry for your loss. A crustacean's living conditions general health affect its ability to molt. Sick or otherwise unwell crustaceans molt abnormally and may not molt at all, and if a crustacean can not molt when it needs to, it will die. When an illness or stressful situation limits the crustacean from molting, it will literally explode in its shell. The cracks induce sepsis from the numerous infectious agents now able to attack the soft inner body. In Thunder's case, it appears that his living conditions were suitable generally and he was in more or less robust health, so what other factors might have been at play? It is possible that, despite Thunder's well-kept tank, the stress from too many visitors kept him feeling unprepared for a molt. Did one of his numerous visitors offer him something potentially poisoinous? One must keep in mind that Thunder might have been nearing the limits of his lifespan. You don't mention a physical description, but most Fiddlers live no more than two or three years. One species, Uca senex, lives to be seven years old in some cases, but that is an exception to the norm. It is possible Thunder had scuttled through the greater part of his life when you inherited him, and either his own old age or the stresses of students and moving to your residence finally knocked him off. One must not blame onesself for such tragedies, however; only in dealing face-front with crustacean rearing and death does experience build. Check out some crustacean or aquarium literature from your local library and consider your time with Thunder. The next little friend you take in will benefit. 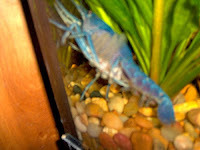 We purchased "Pinchy", an electric blue lobster about 7 months ago from a local fish shop. He has been extremely healthy as far as I can see, always eating, molted about every 60 days, great colour, very active in the tank torturing our other fish. Tank is 90 gallons, pH about 6.5, temp about 76 degrees. Last night "Pinchy" was alive and well, cruising around the tank looking for treats. This morning "Pinchy" was dead, lying on the bottom, no signs of struggle. Water is fine in the tank, nothing is broken, nothing else is dead, the other fish had not even touched him yet. What is the average lifespan for this type of lobster? Also, anything off the top of your head that you think he may have "caught" disease-wise? It just blows my mind that he died for apparently no reason. There is nothing more shocking than seeing your perfectly healthy little friend lying belly-up at the bottom of the tank, legs gently swaying in the current. It is this kind of unexpected, unsymptomed death in otherwise healthy individuals that is called Sudden Crustacean Death Syndrome, or Scruds for short. As with any syndrome, Scruds describes related symptoms but not the underlying cause. In your case, Pinchy may have had several conditions, including a bacterial infection, a congenital neural disorder, or chronic aging. The possibility of a bacterial infection here seems minimal since you describe Pinchy as being healthy and active, though sepsis-related Scruds of healthy individuals is not unheard of. It also doesn't sound like you are unfamiliar with aquarium maintenance so the possibility of a bad water change, temperature shock, or chemical poisoning seem likely. In the case of a neurological disorder, the defect is inborn and there is no real way to prevent its onset. Crayfish family histories are so hard to track outside of a lab that buying an animal commercially is a crapshoot as far as genetic health goes. If this was the case with Pinchy, a shift in water temperature, introduction of a specific bacteria, or an slight shift in chemicals or other factors could have caused his nervous system to short circuit. The most likely explanation for victims of Scrubs remains, however, is chronic aging. Chronic aging is a perennial issue with any life-based organism, as complex systems wear out over time due to the degradation of DNA during the replication process. You didn't mention how old your crayfish was, only that you'd had it for seven months. Species typically sold as "Blue Lobsters" (see the end of this entry) typically live from two to four years with some captive specimens living five or six years. One notable case, a specimen named Methuselah, lived to be an astounding ten years of age and only died when an undergraduate lab tech cooked and ate him. Size is the key to your cray's age. Anything beyond four inches is a good indicator that the cray is at least middle-aged and one can only hope for a few sweet months and expect to get them. This is one reason why buying younger crays is a good idea as you get more cray for your money; that is, until a treatment or cure for chronic aging is discovered.